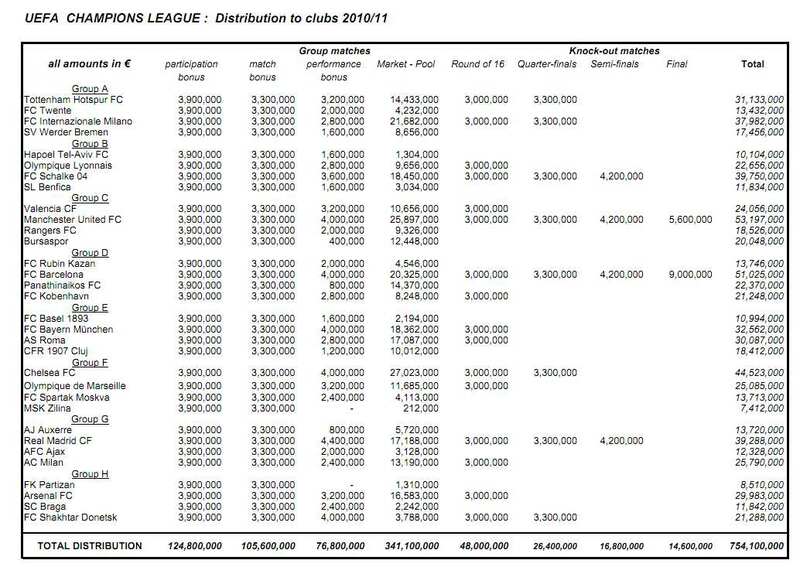 Uefa’s detailed figures showing the precise amounts of money earned by the 32 clubs involved in the Champions League in 2010-11 are in the table below, and Uefa’s article on these numbers is linked here. Payments are essentially split in performance money (dependent on results and progress) and TV cash (market pool share, depending on size of TV market in each club’s country). Runners-up Manchester United (€53m) made more money than winners Barcelona (€51m), because of the TV money. Quarter-finalists Tottenham (€31m) made more than north London rivals Arsenal (€30m) by going one round further, despite less TV money. Chelsea made more TV money than anyone (€27m of €44.5m total) and that’s because they won the Premier League in 2009-10, which was the qualifying season for 2010-11 CL. The better you did in the qualifying season, the more TV money you get. And the Premier League clubs are the most ‘valuable’ collectively in TV terms.